Got Focus Issues? Here Are 5 Natural Ways to Boost Your Attention! Do you have trouble concentrating in class or during meetings? Do you get antsy when listening to a speaker for an extended period? Does your mind drift from one random thought to another, never really focusing on the topic at hand? If you answered yes to any of these questions, you might have an attention problem. In today’s busy world, giving our complete focus to just one thing or person is becoming increasingly difficult. Attention issues not only impact performance in school, work, relationships and daily tasks, they also affect the way we function as human beings and how we perceive the world. Despite traditional thought on the subject, the rapid rise of attention problems afflicts more than just the young in our society. A growing number of adults are finding it harder to remain organized, stay on task, and complete projects. Since attention issues are not just a single or simple problem, coping is not a one-size-fits-all solution. But there are natural ways to approach this problem and boost your total mental performance in the process. Attention problems remain one of the most misunderstood and incorrectly treated issues today. Unfortunately, many people use ineffective or harmful strategies (such as abusing substances, overcommitting to work or activities, toughing it out or ignoring it altogether) in dealing with their focus challenges. Attention concerns can be aggravated by a variety of factors, including poor diet, environmental toxins, lack of sleep, stress, and limited physical activity. Unaddressed attention challenges can have alarming consequences and are associated with higher incidences of academic problems, low self-esteem, job failure, incarceration, obesity, and divorce. Trouble concentrating? Can’t sit still? Attention Support can help you relax, stay calm, and increase your attention span – all at the same time. Increase your (or your child’s) potential with Attention Support’s natural focus boosters. Its ingredients were picked for their clinically proven benefits to attention, concentration, calm, and overall self-control. 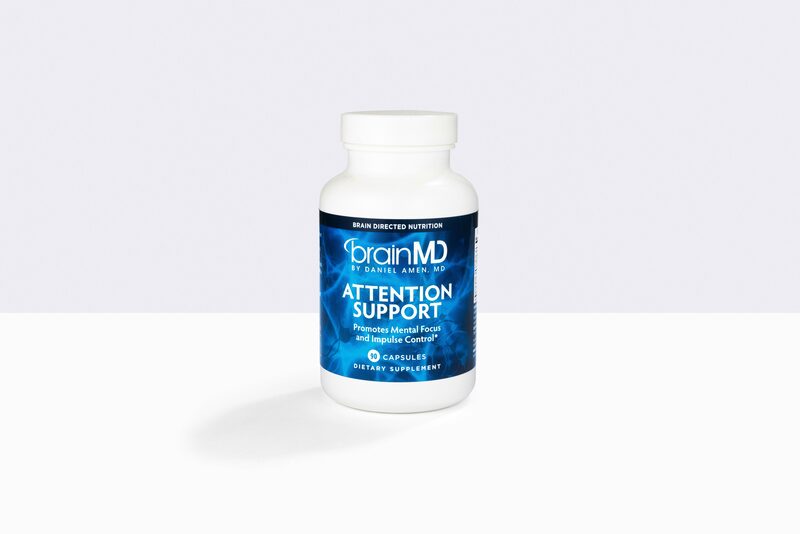 Clinical child and adult psychiatrist and brain imaging expert, Dr. Daniel Amen, worked with the BrainMD team to carefully select the well-studied ingredients in Attention Support. Working through multiple action pathways in the brain, its nutrients and herbals can help your distractible brain circuits self-correct to better stay on track. Choline – a vitamin-like nutrient that supports the brain’s production of acetylcholine, a key neurotransmitter for attention, learning and memory. Choline also contributes methyl groups that help the brain make neurotransmitters and maintain its circuitry. Per FDA guidelines this formula is classed as an excellent source of choline. Magnesium – a mineral essential for life yet lacking in most people’s diets. Magnesium is fundamental to the brain’s ability to generate energy, maintain its nerve cell connections, and conduct the electrical activity that underlies all its functions including focus, memory, mood and behavior. 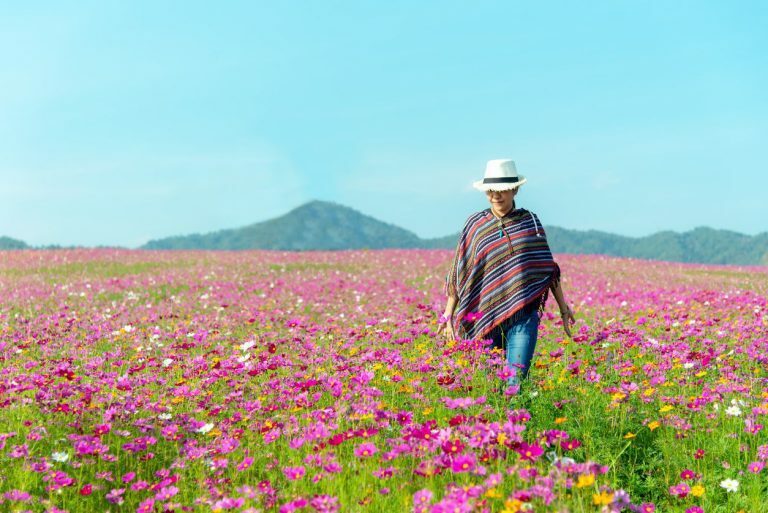 PhosphatidylSerine (PS) (soy-free, from sunflower) – highly concentrated in the brain and a natural building block for the trillions of nerve cell connections that make the brain work. Clinically proven to support healthy attention, learning and overall mental focus. Pycnogenol® – a powerful antioxidant concentrate sustainably harvested from the French maritime pine tree. Promotes delivery of blood to the brain and is demonstrated to improve attention in clinical trials with kids, university students and seniors. 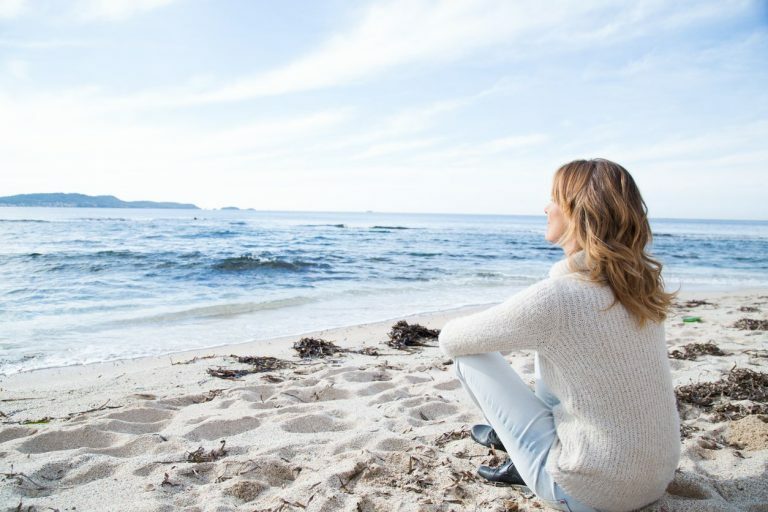 Vitamin B6 – an essential cofactor for several enzymes involved in the production of neurotransmitters linked to attention and healthy mood control, especially when used together with magnesium. Zinc – another essential mineral, required by at least 100 enzymes and for crucial antioxidant protection of the brain. Zinc has consistently enhanced children’s attention and behavior in clinical trials. Attention Support is extremely well tolerated and was developed for both kids and adults. Children 4 years and older can take 3 caps per day, preferably between meals. Adults can take up to 6 caps per day, or more as guided by a nutritionally-informed physician. Attention Support contains no soy, milk/dairy, gluten, wheat, yeast, eggs, corn, sugars, or artificial colors or flavorings. Being calm, focused and making better decisions leads to a greatly enhanced quality of life. Imagine the joy of accomplishing things on a consistent basis. It all starts with giving your brain the nutrients it needs, so that its self-regulating processes can keep on top of challenges and allow you to stay focused and productive. A One-page Miracle (OPM) can help you make better choices, which will enable you to achieve more in life. Write down the specific goals you have for each major area of your life. Then ask yourself every day, “Is my behavior getting me what I want?” This simple but profound activity can aid the process of turning your thoughts into reality. Click here for tips on how to create your own OPM. Decades of clinical research has shown that prayer, meditation, visualization, and self-hypnosis can calm stress, enhance overall brain function, and improve focus, mood, and memory. Taking 5 to 10 minutes twice a day to focus on your breathing, gratitude, a beautiful scene in nature, or scriptures can have a tremendous impact on your life. Get rid of distractions when you prepare to study or focus on a project. Put your phone on airplane mode and turn off your devices. Although multitasking may seem like the best way to get things done, even people practiced at multitasking typically don’t do it very well. Taking occasional tech timeouts can help you find balance, so you can focus on the most essential areas of your life. The sugar-filled, pesticide-laden, high glycemic Standard American Diet (SAD) leads to increased distractibility, decreased energy, and greater illness. For people who struggle with attention and focus, a diet high in fiber, with high-quality protein and healthy fats (especially omega-3s and monounsaturates), can have a powerfully positive effect on brain function. It’s especially important to eat protein with each meal and snack, which helps to stabilize blood sugar levels and maintain focus. If your attention is scattered by a million things, it might be time to take a break. We all need time to recharge our batteries and self-care is often the best thing you can do to refocus your thoughts and emotions. Get a massage, read a new book, or listen to your favorite music. Engage in meaningful and beneficial activities on a regular basis. Do work that you enjoy and have fun with your loved ones. 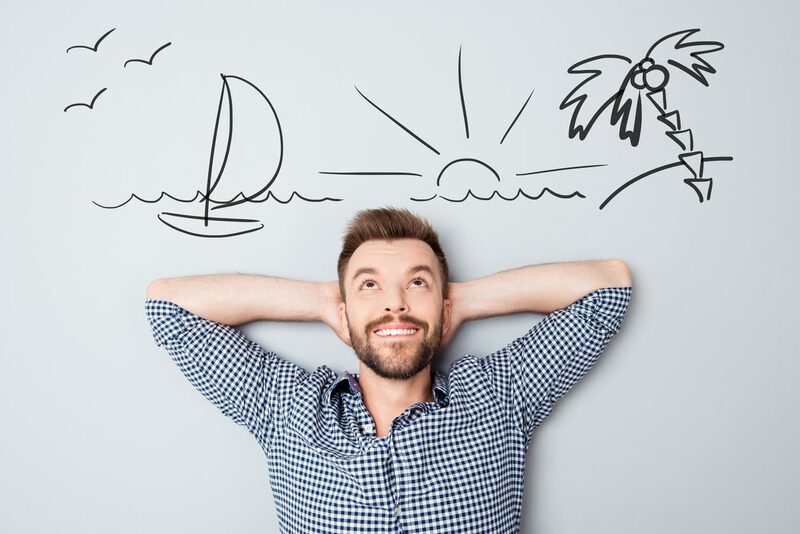 Focusing on positive people and activities can help you achieve balance both mentally and physically, so make time for what matters most in your life. 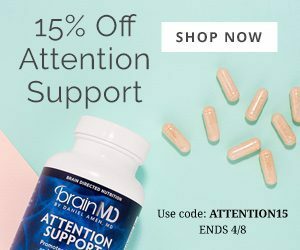 For more information about Attention Support and our full catalog of brain healthy products, please visit us online at BrainMD.